This paper presents a scalable and efficient method for the preparation of Sn-containing carbon nanostructures, based on the cathodic erosion of graphite electrodes in molten LiCl–SnCl2 salt mixture. The product obtained was characterized by means of X-ray diffraction and electron microscopy. It was found that conducting the process in nominally pure argon containing a low concentration of oxygen leads to the formation of Sn-encapsulated carbon nanostructures as well as SnO2-decorated carbon nanotubes (CNTs). On the other hand, CNTs decorated with SnO2 nanocrystals could be synthesized in high yield in the presence of higher concentrations of oxygen. 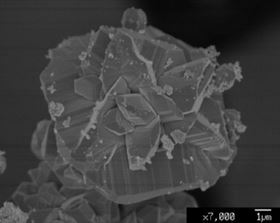 The oxidation of SnCl2 to SnO2 nanocrystals was found to be both thermodynamically and kinetically possible in atmospheres containing very small quantities of oxygen and to avoid the formation of tin oxides, it was necessary to perform the process under reducing conditions. The tin nanostructures encapsulated in carbon shells were found to be stable upon washing with water and drying. The results obtained provide essential knowledge to control the molten salt process. This paper was originally published in Materials Today Communications, 2 (2015), Pages e38-e48.